Weston Lake is for the Military and their Guests. Sorry we are not open to the general public, you need to be an authorized patron to utilize these facilities. Looking to get away for the weekend? Weston Lake makes it easy to get the feeling of the great outdoors getaway without the drive. Located on Fort Jackson, only a short 5 minute drive from Gate 5, Weston Lake Recreation Area feels like a world apart from your regular workday world. Weston Lake has you covered whether it is a place for an afternoon picnic, a waterfront cabin for a long weekend, an air conditioned building big enough to house the largest of family reunions or a place to park an RV. Want to get away, but still like the creature comforts like air conditioning, hot water and a nice bed to sleep in, check out the cabins at Weston Lake. We have several sizes with options to fit any budget. 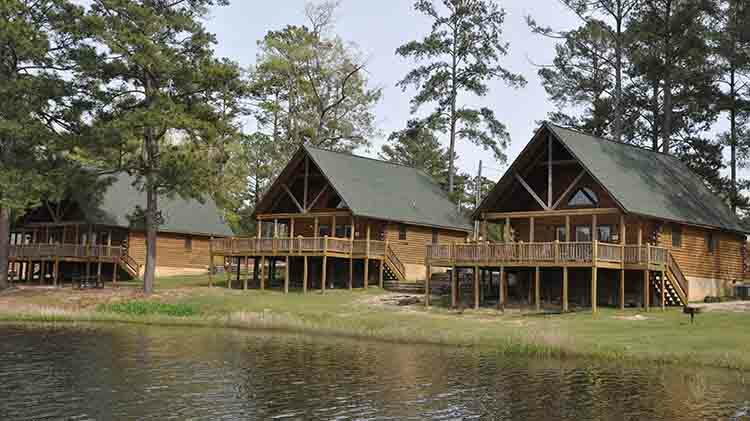 Most cabins are on the waterfront and include sheets, bedspreads, and towels. Bring some groceries and prepare your meals in the fully stocked kitchens. Got an RV, camper or tent and looking for a place to set it up for a day, week or season. at Weston Lake can help you out in style. Got a get together that needs some indoor space to beat the South Carolina summer heat? Our Community House can handle up to 400 seated guests and has separate restrooms and a kitchen preparation area. With a little time, imagination and your own decorations you can turn it into the meeting place of your dreams. Looking to beat the heat by getting wet? Come check out our swimming beach open Memorial Day Weekend through Labor Day. Play a little sand volleyball or climb around on one of the state of the art playgrounds. Or take a spin on one of our self powered craft, paddleboats, kayaks, and canoes. We also have larger powered boats for those over 18 with a DOD ID, including a pontoon, and john boats. Weston Lake also has covered shelters with picnic tables to fit most any group. Come and enjoy your own reserved area to get a little shade and find sanctuary for those pesky afternoon showers South Carolina is famous for.